Jim Carrey has quite the resume – film and television star, Golden Globe winner, stand-up comic… and now he can add author to the list. Today marks the release of Carrey’s first book – a children’s story entitled How Roland Rolls, the tale of an ocean wave named Roland who worries that he might not exist anymore once he hits the shore. With pundits like Deepak Chopra championing the book, it’s likely to be a pretty big deal in preschool lit this week. 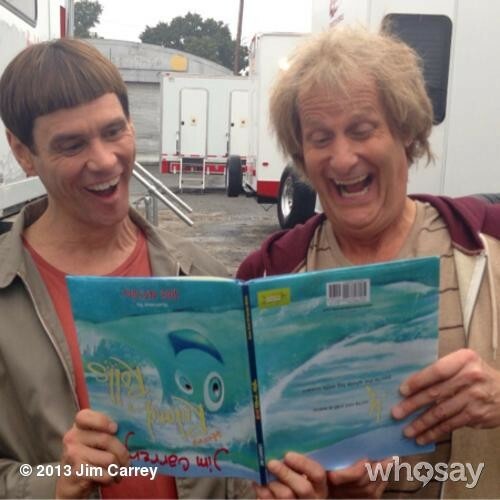 However, the best thing to come out of How Roland Rolls’ release (say that five times fast) is that it led to this awesome new photo of Dumb & Dumber To characters Harry and Lloyd checking out the book. Word on the street is that the preschool-aged story might be a little too complex for these guys. We’ll have to wait and see whether or not that turns out to be the case, but there’s no denying that it’s great seeing Carrey and Daniels back in action in this photo. Filming on Dumb & Dumber To is set to start today.